Riley is super friendly and loves to be around people! 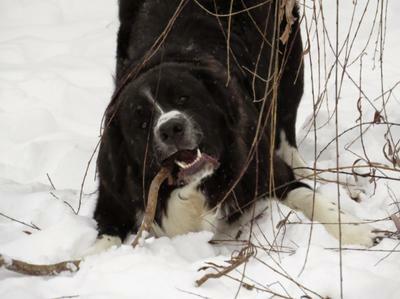 He's a happy, goofy, playful boy who is looking for an active family to call his own. Born March 1, 2014 Riley is just a pup at 12 months of age. 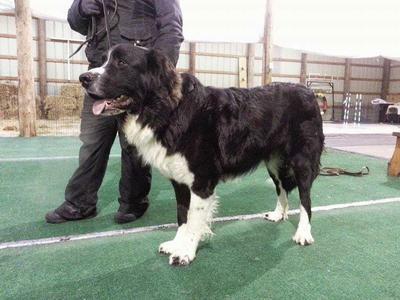 He is a Great Pyrenees/Bernese Mountain Dog/Newf mix and is cute as ever! Riley is friendly and social, enjoys attention and is eager to please. He responds well to clear direction from a confident handler. Like a typical young male, he can be a bit stubborn at times, but with kind and clear expectations laid out he has quickly learned what is expected of him. He is very eager to please, has excellent leash manners and house manners....well, except for occasionally counter surfing! Riley has started attending obedience classes and has proven himself to have excellent focus -- he's a great candidate for someone who is interested in doing obedience and working dog activities. The mental and physical stimulation needed for this type of work is exactly what Riley needs. Riley has done very well meeting and playing with many new dogs since he arrived in foster care. His surrendering family did have some difficulty with him and another dog, but so far we have not seen any indication of issues with other dogs at all. 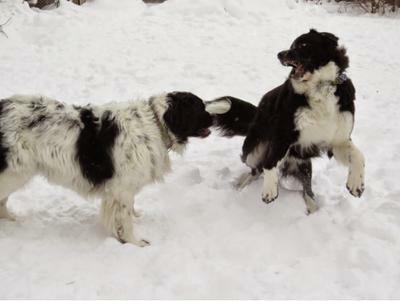 In this video he is being goofy and playful with several dogs at his foster home. Riley is a boisterous boy who plays hard so is best suited to a home where he will have a playmate of comparable size, and who is very well mannered around other dogs. He can become overstimulated easily, so a companion who is mellow and will calmly correct him when he plays too hard will be a great benefit for him. He is not suited to a home with another dog who also becomes overstimulated easily. He is also not suited to a home where he will not have a playmate -- this boy loves to romp and wrestle so he definitely should have a four footed pal to play with! He is best suited to an adoptive family that is experienced with giant breed dogs, and who are interested in pursing training activities with him to harness his energy and keep him mentally stimulated. He is not a suitable dog for first time dog owners or people who are not well versed in the training and care of giant breed dogs. Because he is a young, boisterous boy, homes with young children are not a suitable match for him. Riley has been vet checked, is UTD on vaccines and has been neutered. To be considered for adopting Riley please complete our adoption application and email it back to us. Riley is being fostered in the Mississauga area and his approved adopters will be required to pick him up in person. An adoption donation of $500 applies. Please refer to this website to find out how to adopt this boy.